Set as the Second Section Test Piece for the 2019 National Finals of the British Brass Band Championships. Occasion was published especially for the National Youth Brass Band Championship of Great Britain, held at the Royal Albert Hall, London, on 4 October, 1986. 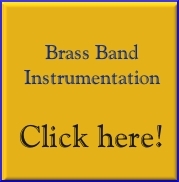 Occasion for Brass Band is in four movements: Fanfare, Festivities, Elegy, and Dance. The opening Fanfare was originally written as a Wedding Fanfare for Paul and Hazel Patterson in 1981, while the Elegy and Dance were commissioned as a test-piece for the first Westsound/Ayrshire Invitation Contest in 1982 for the leading bands in Scotland. Festivities was therefore written last, to complete the work and give it its essentially ‘festive’ character. Except for the Elegy, which is contemplative, the music throughout is extrovert and joyful. The opening Fanfare may be performed separately — or the Fanfare may be left out entirely, making the work a three movement Suite.